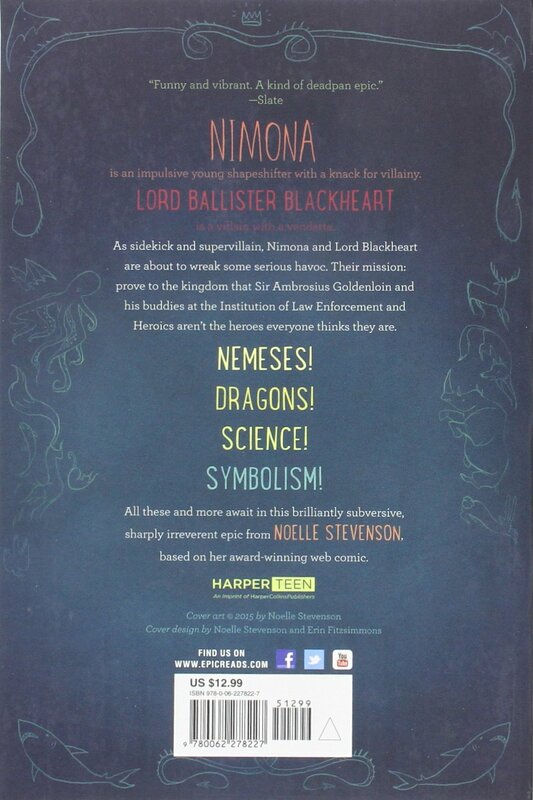 The story starts out with gusto: a villain, Lord Blackheart, is joined by Nimona in his lair. She claims to have been sent by an agency, to be his new sidekick, but he does not believe her... when she finally wins him around and accompanies him on his nefarious crimes, he soon finds her fiercer and more ruthless than he ever imagined - but also oddly adorable. From the first page to the last, it's full of affection for its characters, which shines through in the art, the characters' facial expressions, the story. 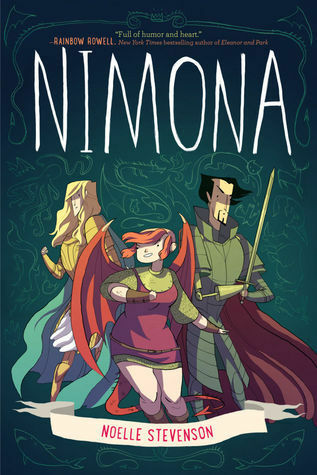 Nimona is very child-like, Blackheart, though aloof, is quite gooey inside, and their nemesis is a lot more concerned with his appearance and reputation than with his deeds or his true inner self. Of course, any story with a villain as its protagonist needs a sense of mischief to work, and Nimona has plenty of that. This isn't like Wicked (the book), pseudo-literary and boring. It's more along the lines of Despicable Me and Megamind, except it doesn't shy away from violence and lethal collateral damage. As you might guess from a book which lists its selling points on its back as "NEMESES! DRAGONS! SCIENCE! SYMBOLISM! ", the tone of the story is light and filled with enthusiasm. It has that slightly quirky tone of a tale written for (or by) young people who grew up with LOLcats, ALL THE FEELS, emojis, animated gifs, SQUEEE, Hyperbole and a Half, internet subcultures, cosplay and an extrovert love of playfulness. It maintains the playfulness and quirky mischief for quite a while, but as the story heads for its big showdown, things get a little more serious. Personally, I did not love the final act. The tone shifted a little farther than I'd liked towards taking itself seriously. Some aspects did not quite work for me... but for other reviewers, the ending worked well. It's definitely a matter of personal taste. All in all, a graphic novel I'm happy to recommend. Well worth a read! I am commenting just to be contrary, but I would never put Despicable Me and Megamind in a list of ideas that were similarly handled. On the plus side, look I'm reading a review longer than one sentence. What a good person I am.